Breva presents the new platinum Génie 01 in a limited edition of 12 pieces — the world’s first wristwatch to forecast the weather with built-in barometer and altimeter. Breva’s 950 platinum-cased version of its ground-braking timepiece features a transparent sapphire dial to display the intricacies and complexities of the movement. The movement’s rear aspect can be observed through the crystal case back. To ensure the legibility of the data on the see-through dial, Breva has fitted raised galvanic numbers and markers and blued steel hands on the hours and minutes dial, a deep blue-hued barometer dial at 2 o’clock and blue raised numbers on the altimeter dial. Génie 01’s proprietary caliber, developed for Breva by master watchmaker Jean-François Mojon at “Chronode”, features a patented mechanism consisting of dual aneroid capsules to measure air pressure. The mechanical, manually-wound movement informs the wearer with a small seconds dial, altitude indicator, barometric pressure indicator, power reserve indicator, air pressure equalizer, equalizer seal indicator, barometric scale adjuster, and altitude scale adjuster. 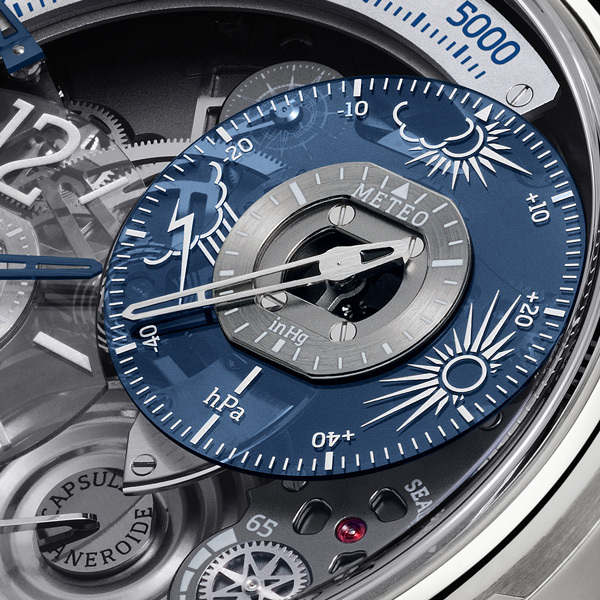 The Génie 01’s power reserve is 65 hours, with a blued steel indicator showing the estimated remaining power. 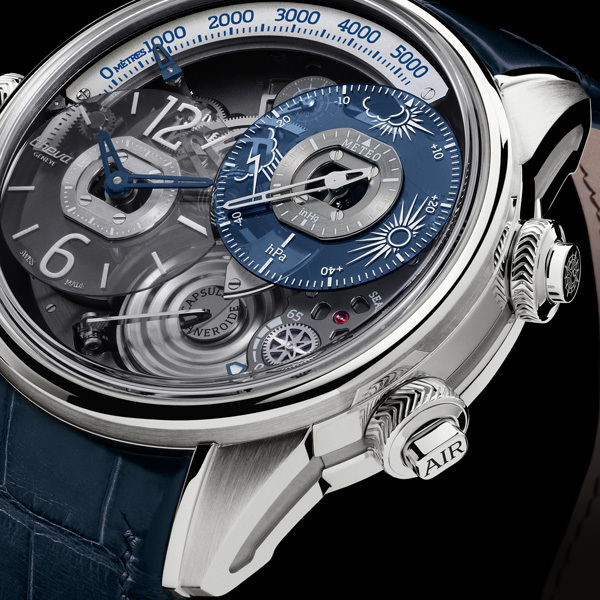 Génie 01 Limited Edition in Platinum is fitted with a hand-stitched, navy blue alligator strap. Selected and cut from the finest parts of the hide – the area chosen for its large, square scales – it is comfortably and reliably secured with a 950 platinum fold-over clasp. 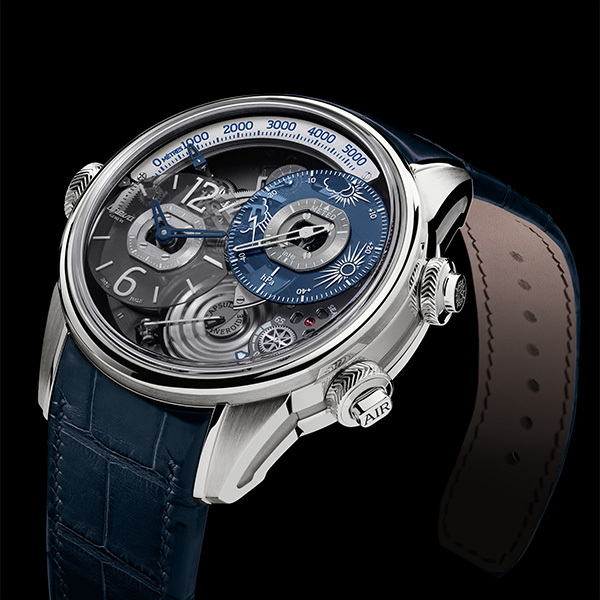 With Génie 01 Limited Edition in Platinum, Breva offers the world’s first and only true “meteorological” watch in a luxury context befitting its unique status. Movement: Proprietary caliber developed for Breva by master watchmaker Jean-François Mojon at “Chronode” with patented mechanism featuring dual aneroid capsules to measure air pressure. Mechanical, manually-wound movement, small seconds sub-dial, altitude indicator, barometric pressure indicator, power reserve indicator, air pressure equalizer, equalizer seal indicator, barometric scale adjuster, altitude scale adjuster.